One of the most recognizable types of pet birds, the Amazon parrots are a delight to most who come into contact with them. If you're looking for some intriguing tidbits of information on the various types of Amazon parrots, then you've come to the right place -- read on to learn some insightful details on where these birds come from, what it's like to live with one, and much more. You may even end up deciding that you'd like to seek out more information on a particular Amazon species that you'd like to keep as a pet! Amazons are among the largest parrots. Growing up to 18 inches in length from the beak to the ends of the tailfeathers, the Amazon parrot is one of the larger bird species commonly kept as pets. Because of this, they require a rather spacious cage, and plenty of room to fly, play, and exercise. Like other large parrots, Amazons need a variety of toys that they can throw, chew, climb, and swing on. They are very intelligent birds that can quickly bore if left to their own devices, so they are recommended for owners who love to play and are looking for a pet that they can spend a lot of time interacting and socializing with. There are a wide variety of Amazon species. While one of the most popular Amazon parrots is the beautiful Blue Fronted Amazon, there are actually many different Amazon species available as pets, in all the colors of the rainbow. For example, there are Red Lored Amazons, Yellow Naped Amazons, Orange-winged Amazons and even Lilac Crowned Amazons just to name a few. With a range of personality and temperament traits as wide as the colors of their plumage, there is an Amazon parrot out there for just about every bird lover's lifestyle. Amazons are known to be among the most proficient talking birds. 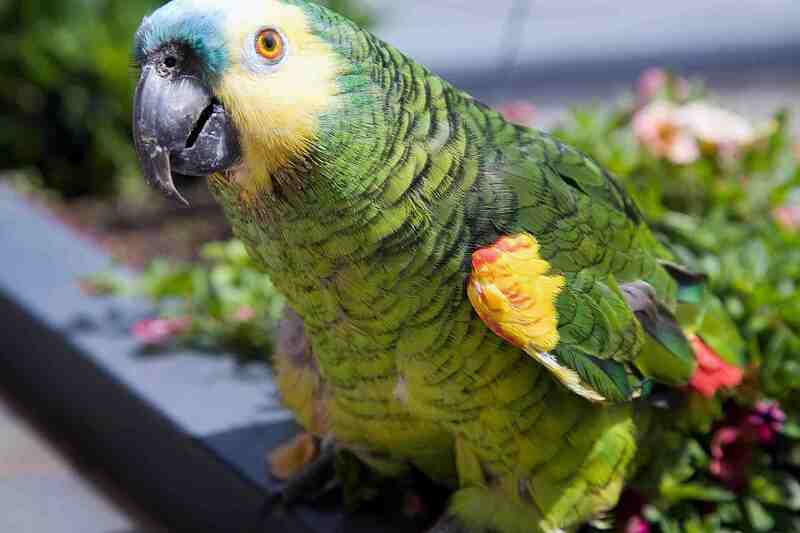 Chances are, if you've ever heard a talking parrot on TV, that bird was an Amazon parrot! In fact, other types of parrots have even "beak-synced" on television programs when it was actually an Amazon parrot's voice that was being heard. The most notable instance of this was on Animal Planet's Puppy Bowl program in 2009. An African Grey Parrot named Pepper was purported to sing the National Anthem to kick off the game, but in actuality, Pepper was just mouthing along to a recording of a Yellow Naped Amazon parrot named Boozle! Amazons have a widespread range in the wild. Amazon parrots have origins in several places in the wild, ranging from parts of South America to the Carribean, and even on into Central America and Mexico. Because their natural homes are so close to the equator, Amazon parrots thrive in warm, humid climates, and their owners must protect them from cold and drafts in places that experience chilly weather. Many Amazon parrots also enjoy being misted with water once or twice per day, which might be attributed to the rain forest origins of some particular species. Misting can also have health benefits for these birds, including a positive effect on respiratory function. Amazon Parrots can be extremely loud. Anyone who has ever lived with an Amazon parrot will tell you that these birds can be very, very loud when they decide to be! In the wild, mated pairs might sometimes find themselves separated by vast distances as they forage for food each day. In order to keep track of each other's location, they will often bellow contact calls back and forth. Those who own a pet Amazon can expect the same sort of behavior in their homes -- pet birds like to keep track of their owners, too!